My kids and I are all movie nuts. We love to watch movies for entertainment but we also enjoy analysing the films, discussing the themes and dissecting the details. We like to draw characters and scenes from films and my kids also like to make their own movies. 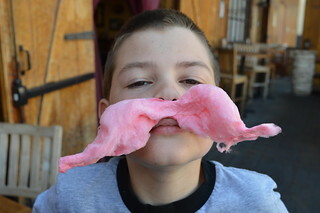 My 11 year old currently wants to be a Director and my 10 year old wants to be a cinematographer – or a taxidermist. 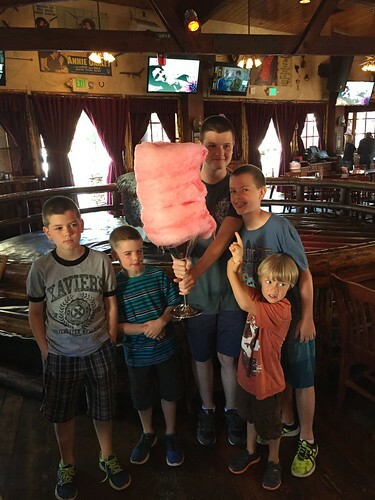 It was, therefore, an absolute Must Do that we take the boys to Hollywood so – topped up with energy after our meal at Saddle Ranch – we headed to Hollywood Boulevard. 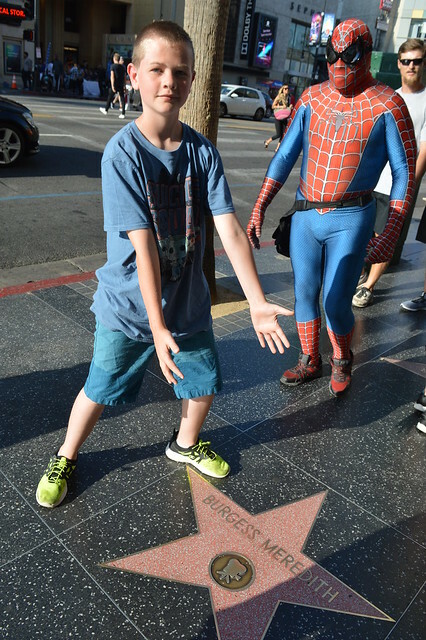 The streets were absolutely heaving with people and everyone was moving unpredictably as they would suddenly stop to read a name on a star in the pavement (sidewalk) or to pose for a photograph or to quickly dodge someone trying to sell something. 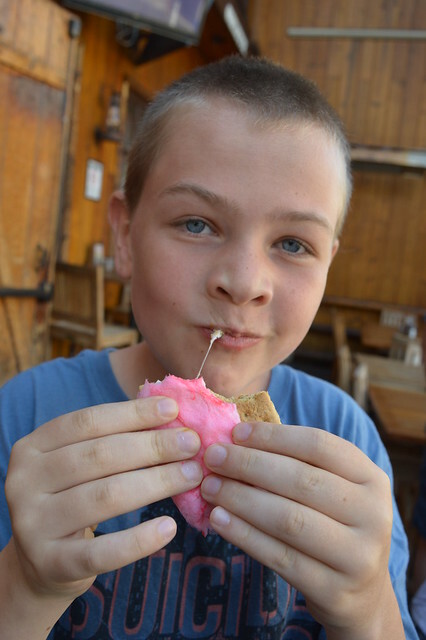 It was the type of crowded situation I would have found quite stressful had it not been for the enthusiasm of my kids. 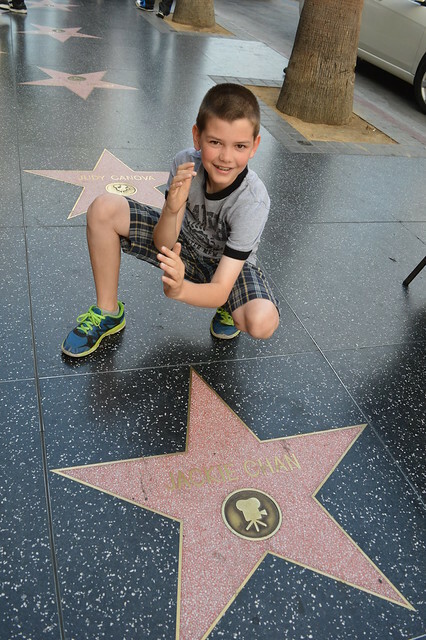 They were running from star to star trying to find the names of some of their favourite actors and directors. The Hollywood Walk of Fame is famously a stretch of the street in which pink terrazzo stars have been placed, outlined with brass and with the name of the person being celebrated in brass letters. 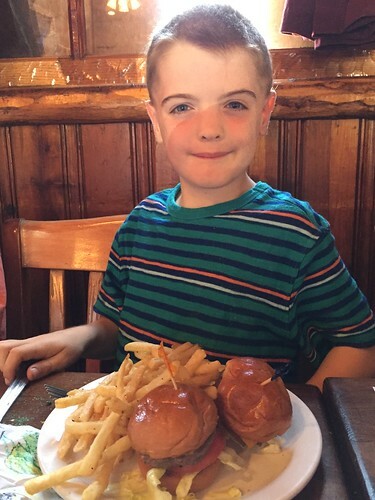 To see my children running around, however, you would have thought that the stars were the celebrities themselves. 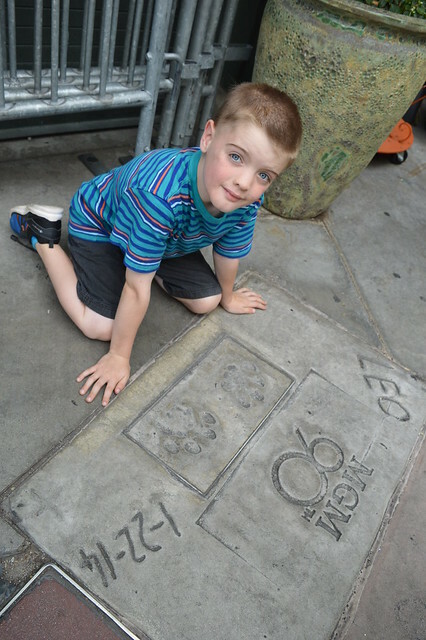 The Littlest Pict was delighted to find the star dedicated to Mickey Mouse and they all enjoyed finding the collective star for The Munchkins. 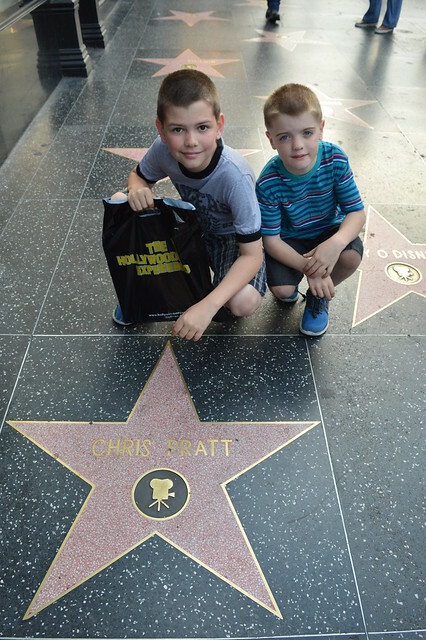 My middle two sons are comic book geeks so they were especially thrilled when they found actors associated with superhero or supervillain roles, whether it was Burgess Meredith from times past or contemporary Chris Pratt. 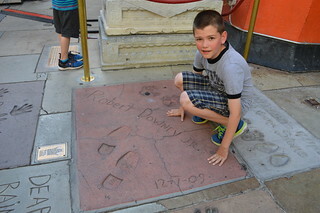 Observing how enthused they were by stars set in the pavement, I knew they were going to explode with excitement when we entered the courtyard of Grauman’s Chinese Theater (known as Mann’s Chinese Theater during my childhood). 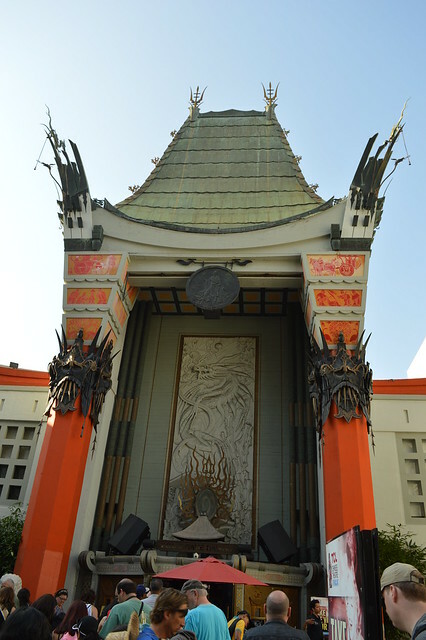 The cinema opened in 1927 and has been the location of countless movie premieres – including ‘Star Wars’ – and a few of the Academy Awards ceremonies. 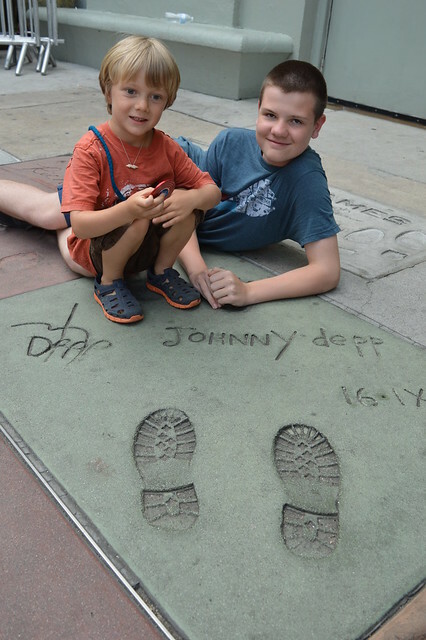 My kids were not there for that slice of movie history, however; what they were there to see were all the hand- and footprints in concrete slabs in the forecourt of the theatre. The origins of the tradition are unclear but all versions seem to agree that it was an accident, of someone stepping into unset concrete, that kicked the whole thing off. 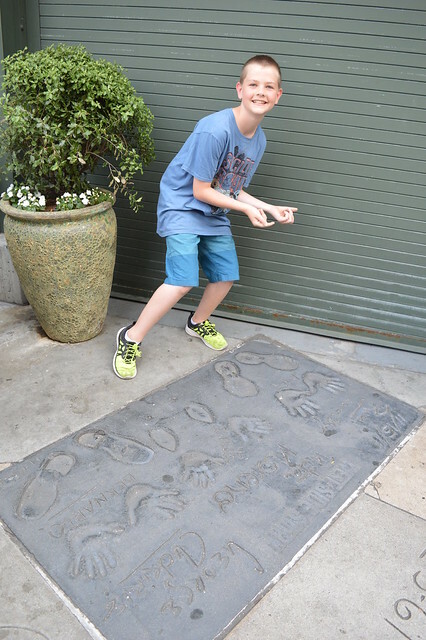 After that, movie stars and directors would immortalise themselves in concrete by placing their hands, feet, and sometimes other objects into the concrete and then autographing it. There must be a couple of hundred celebrity prints in that patch of ground and I am pretty sure my kids visited each and every one. Upon arriving at the theatre, they scattered to different corners and would yell to each other to come and see who they had found and yell to me to come and take their photos beside the slabs. As little movie geeks, their cinematic interests are quite diverse. 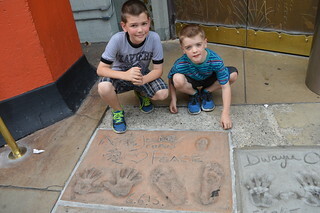 They were every bit as excited to place their hands into those of Abbot and Costello as they were to see the prints – including wand prints – of the Harry Potter cast or of Harrison Ford or Morgan Freeman. 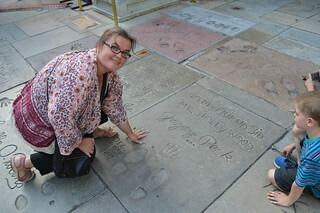 I had favourites from my previous visit to Hollywood (in 2000) and enjoyed seeing those again. 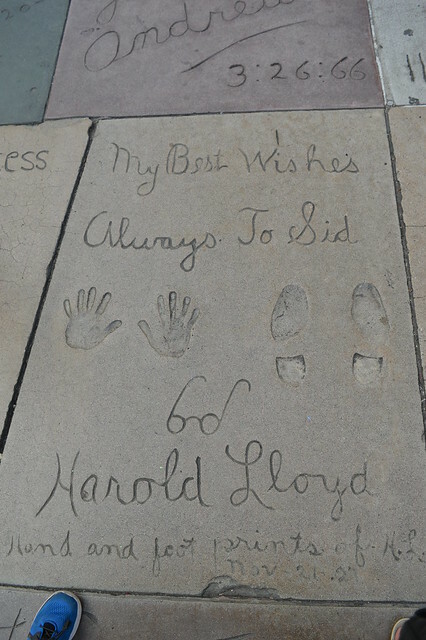 I always loved watching Harold Lloyd when I was wee and remembered loving seeing that he had drawn his round framed spectacles in the concrete and I was happy to see that his slab was still there. Other favourites of mine were James Stewart and Gregory Peck. 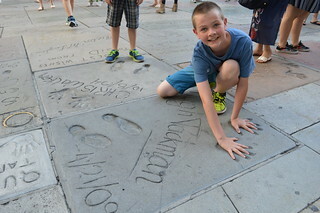 My kids meanwhile – with their younger cousin in tow – loved seeing the prints of the likes of Hugh Jackman, Jack Nicholson, George Clooney, Tom Hanks, Leo the MGM Lion, and Leonard Nimoy. We also had a treat just people-watching as we fought our way through the crowds. There were lots of people dressed up in costumes, earning money by posing for photos with tourists. A Spider-Man who was definitely not a teenage Peter Parker beneath the spandex was especially keen to latch onto my kids but happily they were not biting. There was also a Yoda looking as if Yoda had spent his exiled years on Dagobah eating nothing but pizza, chugging beer, and smoking 60 cigarettes a day. Best of all, however, was Wonder Woman. What made Wonder Woman wonderful was that we saw her get into a fight with an elderly chap on the street. This elderly chap had been making my kids snort with laughter as he was carrying a placard advertising “booty slap massages”. Well, Wonder Woman was having none of his misogynistic nonsense and set to informing him how to market his questionable massage skills without being condescending, intimidating, or belittling towards women. Of course, the old sexist decided to argue back and the whole things became quite the entertaining spectacle. 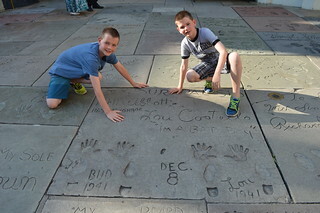 We had planned to extend our Hollywood day into the evening by letting the kids go feral in Griffith Park and taking them to the Observatory. We jumped in our cars and started the ascent up the hill, however, only to discover that the entire route up was one massive traffic jam. Just a little further up and we noted that people were parking on the sides of the already narrow road and were then trudging up to the summit. With cars parked on both sides of the road, there was no opportunity for even a U turn when we reached the point where official notices informed us that all the car parks were full. When I had been to the Griffith Observatory before, there had been maybe a dozen other visitors. I can only assume, therefore, that some special event was happening. Either that or the place had become incredibly popular in the intervening 17 years. So we slowly snaked our way up the hill and then we slowly wound all the way back down again. 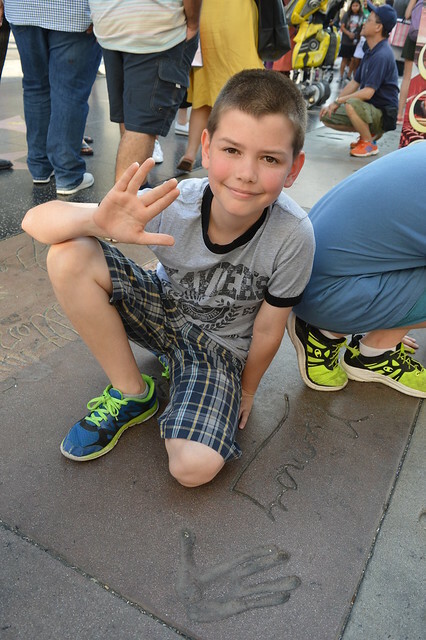 No Griffith Observatory for the kids on this trip. It was not meant to be. 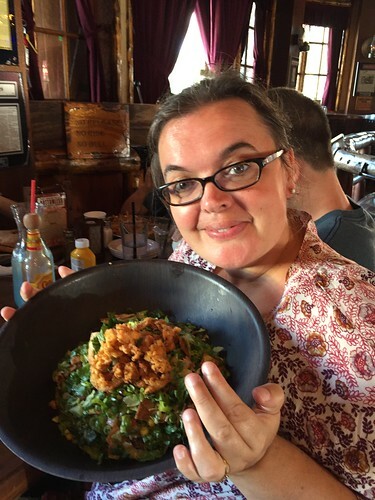 Instead, we took a meandering route back to Venice via Mulholland Drive and Laurel Canyon, as low fog rolled in from the sea and the lights of the city sparkled and shimmered in the darkness. 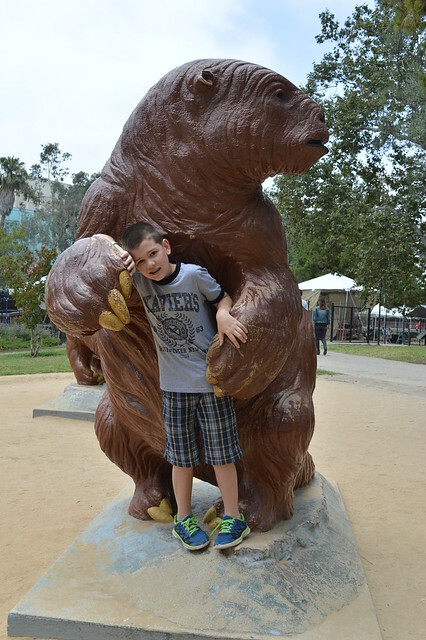 On our first full day in California, we headed – with the extended family – to the La Brea Tar Pits. This was something I had always wanted to do in LA yet had never actually gotten around to doing so I was really looking forward to it. 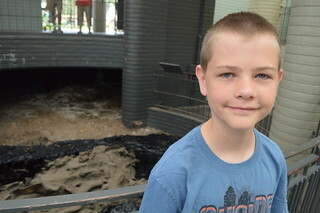 The Tar Pits are actually free to visit but we paid for entry tickets so that we could also visit the on-site museum. It is, therefore, a bit like visiting a very cool, unique public park. 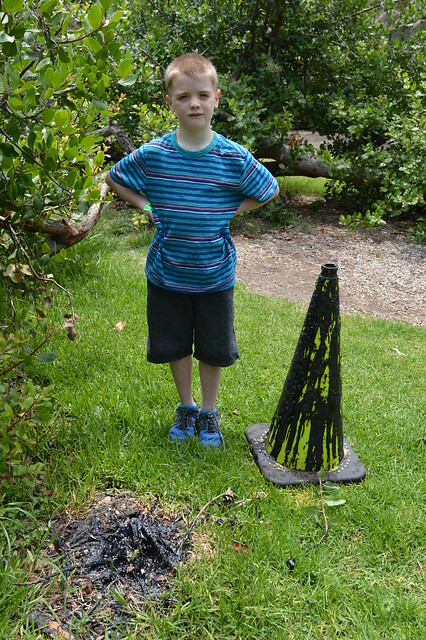 The tar pits are a result of natural asphalt rising up from the earth and seeping through the surface. 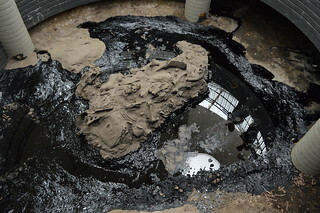 These same tar pits have been bubbling and oozing in this way for millennia. Back in prehistoric times, this gloopy tar would trap animals who got too close and found themselves stuck. It was explained that while herbivores might become stuck, they would then be joined by carnivores who were opportunistically hoping to devour the trapped beasts but would then themselves become trapped. In my mind, I envisaged a pyramid of Ice Age creatures all glued together with black sludge. The black lakes of asphalt would then swallow these corpses down only to burp them back out again millennia later as fossils. Because the oils would be absorbed into the bones, they acted as a preservative. 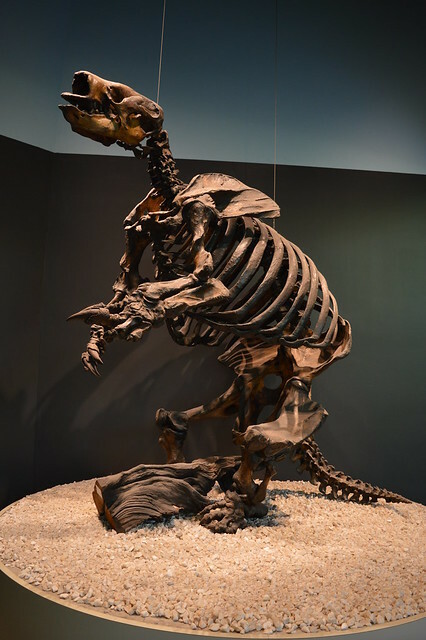 This means that not only has La Brea provided paleontologists with amazing finds of large mammal bones but it has also provided them with tiny fossils of rodent bones, plants, and seeds. 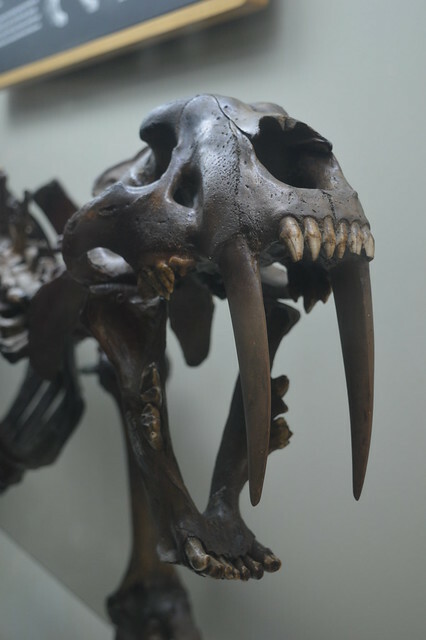 While people were obviously aware of the tar pits during that whole time period – the local indigenous people using it to seal their boats and ranchers losing livestock in them – it was not until the early 20th Century that any effort was made to excavate the pits and record the fossil finds. We were able to visit one such excavation pit and could also spectate as volunteers picked through sludge from barrels of tar searching for fossils. I thought it was pretty cool to be visiting a site still being actively excavated and researched after a century. 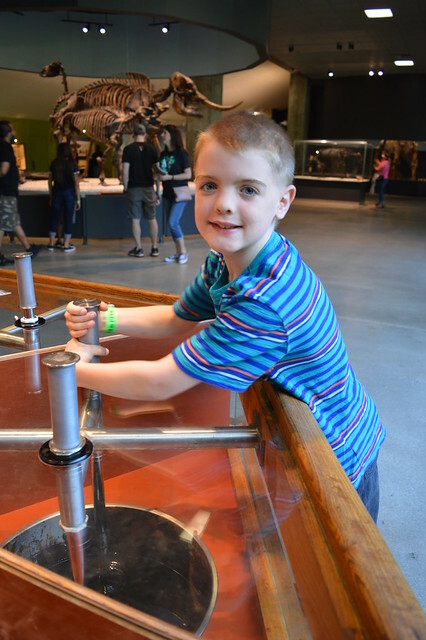 Little me had considered being a paleontologist until I spent a day with a paleontologist and learned how much science was involved in the process. I did not and still do not possess a scientifically wired mind. I still find the whole subject fascinating though. 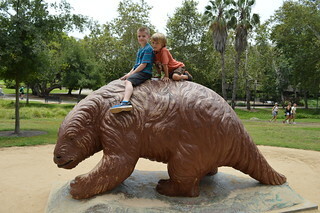 What was great about the tar pits being in a park was that my feral kids could run around and climb to their heart’s content while we adults moved more slowly from pit to pit (which are safely fenced off) taking time to read the information boards and really look at things. In one area, the tar was really bubbling. Cousin J and I found ourselves staring, mesmerised by the continuous formation and popping of gloopy black bubbles on the shiny surface of the tar pond. I think if I owned a tar pit, I would find it rather calming. The kids meanwhile were rather enjoying clambering all over the full-size statues of giant sloths and other prehistoric critters. They also found areas of grass where tar was seeping through the surface. 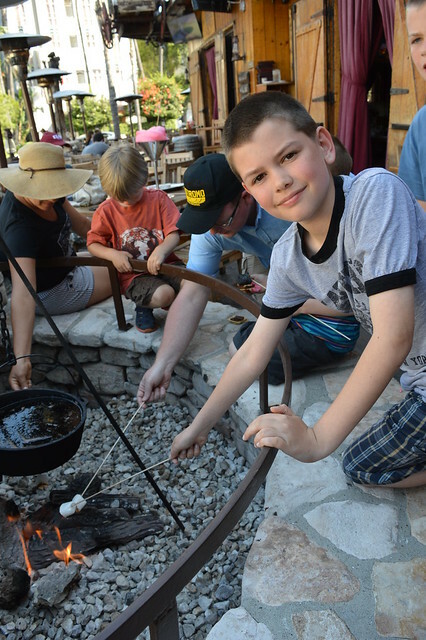 Immediately, all five kids would find sticks to poke into the tar. If they thought they might pull out a mammoth femur, they were sadly disappointed. 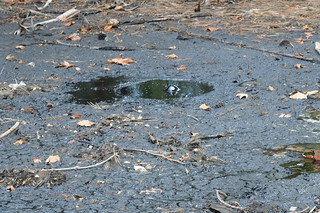 Simply poking the sticks into the black sludge seemed to occupy and entertain them, however. 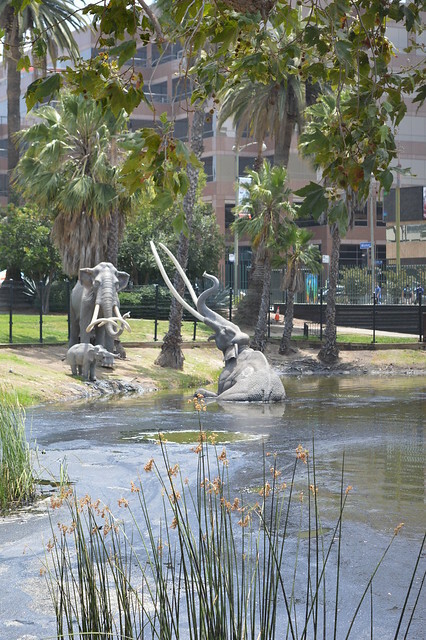 One of the big features of the La Brea Tar Pits is a lake. From a distance, it looks like an ordinary lake, albeit muddy and unappealing looking. Up close, however, it is clear that the oil and asphalt beneath the surface are mixing with the water to create a slick and bubbling pool. What was interesting to me was the way the slick scum of the surface would gather at the edge of the water, creating rippling rings. 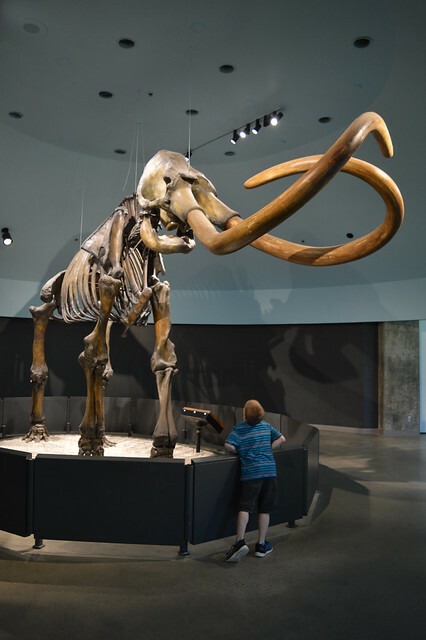 There were models of adult mammoths and a baby at the shoreline to illustrate the “nature red in tooth and claw” point about creatures getting sucked in and mired in the tar, stuck there for eternity – or until a paleontologist scoops them out of a barrel millennia later at least. 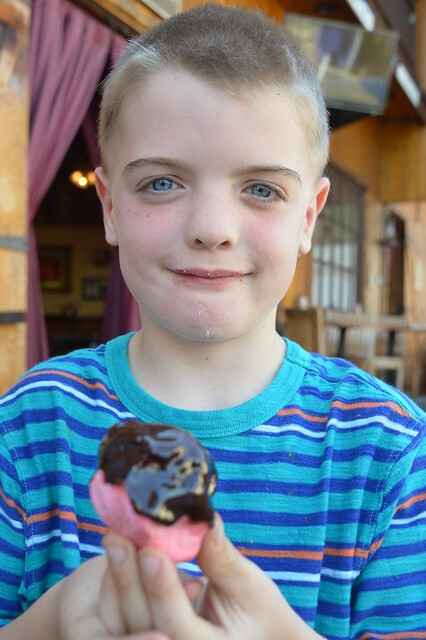 After a quick lunch of fresh fruit, we headed into the Museum. The kids enjoyed a 3D movie about the tar pits, showing mammals getting gulped down as they wandered across the treacherous landscape. For me, however, the highlight was getting to see so many reconstructed fossils from the site. 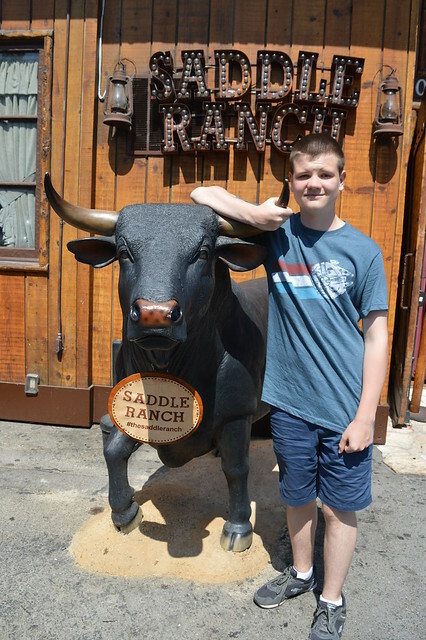 There was a colossal mammoth (if that isn’t a tautology), a giant sloth, prehistoric horses, sabretooths, a cave lion, birds, some sort of archaic bison, and dire wolves galore. If memory serves (which it possibly doesn’t, not reliably anyway) then I think I read that more dire wolves have been discovered at La Brea than any other mammal. This is perhaps because wolves hunt in packs so if one wolf ran into the tar then probably a whole lot of its chums did too. There was a neat diorama showing dire wolves running as if on the hunt with the wolves depicted in different stages of reconstruction, from bare fossils to fur-covered, taxidermy style. There was also a vast wall of brightly coloured, lit boxes each showcasing a single dire wolf skull. While there, a museum docent let the littlest Pict touch the skulls of a coyote, a modern wolf, a fox, and a model of a dire wolf skull. I am so glad I finally made it to the La Brea tar pits. 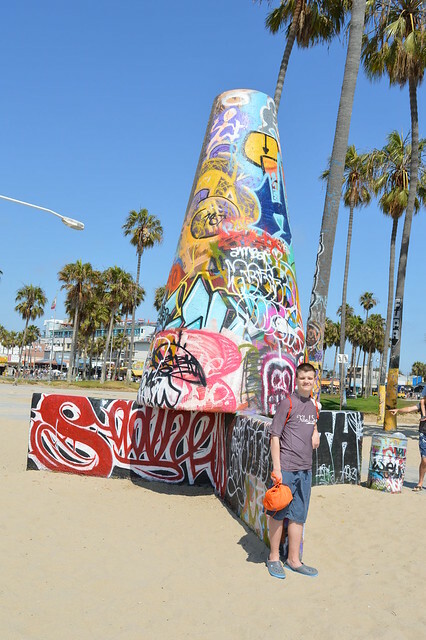 It was a really cool and interesting place to spend a few hours in LA. 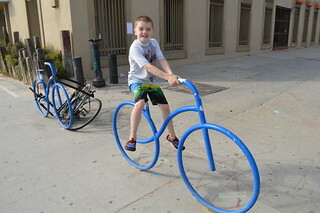 Having arrived at Santa Ana airport and picked up our rental car, we headed directly to Venice, Los Angeles. Mr Pict’s two cousins work in the movie industry and both live in LA. Unfortunately, one was out of state during our visit but happily the other was still at home base. 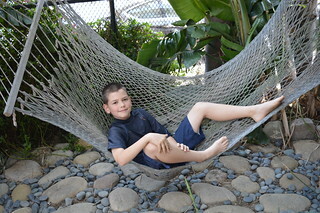 Indeed, cousin J and his family were kind and generous enough to let us stay with them at their property in Venice. J, L, and their son W have a beautiful home – as warm, eclectic, creative, and inspirational as they are – and we were delighted to take them up on their offer while also having the benefit of them as tour guides and wonderful company. After so many hours spent in cars, planes, and in airports, we all desperately needed to stretch our legs and get some fresh air. The kids were also very eager to experience the beach. The house was only a few blocks from Venice’s famous boardwalk and beach so all nine of us got togged up and set out for a stroll. First stop was a bite to eat at a taco place. The setting was a bit rough and ready but the food was completely delicious and we all felt in a better mood post-munch. Venice was founded by a chap named Abbot Kinney at the beginning of the Twentieth Century and quickly established itself as a tourist destination, offering a wide variety of entertainments. By the middle of the century, some dereliction had set in and the area was known for its slums but also for being a centre of creativity and particularly of counterculture. Venice today reflects all of that history. 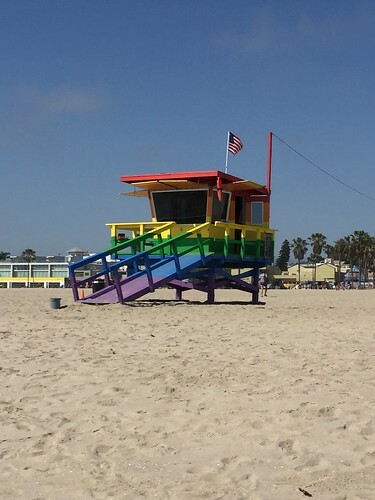 It was impossible to overlook the homelessness and crime in the area but it was also clear Venice remains a vibrant community full of buzzing activity, creativity, and diversity. I loved seeing all of the interesting architecture fronting the boardwalk. 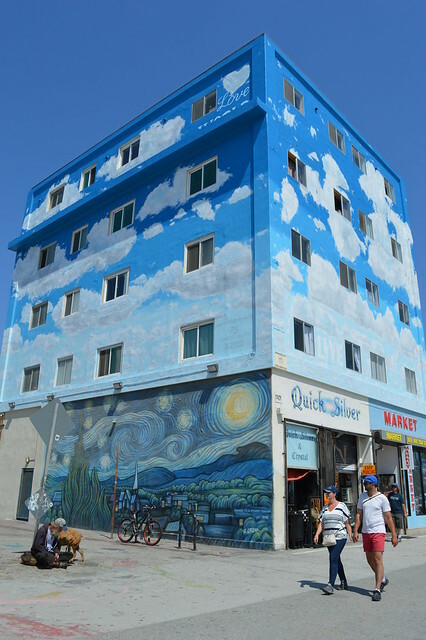 Many of the buildings were brightly coloured and painted with fabulous murals. 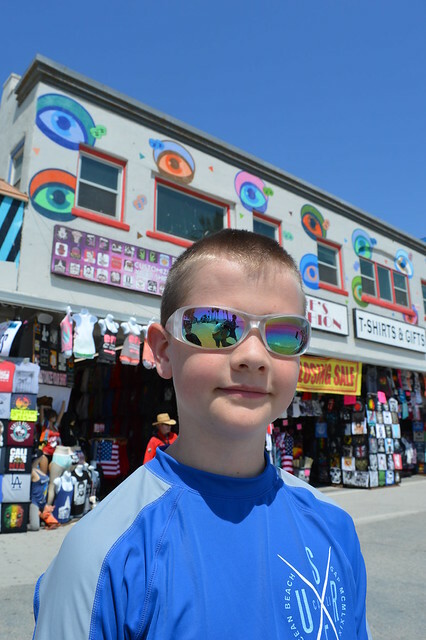 There were also street artists and performers to catch our eye and entertain us as we wandered along the boardwalk. We stopped for a while to spectate skateboarding and were particularly impressed by some of the young kids. I never had any skill whatsoever with skateboards so to see such small kids doing incredible things was pretty absorbing. 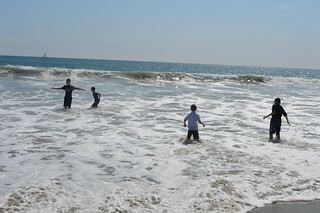 The kids were eager to get into the water so we headed into the sand and towards the shore. 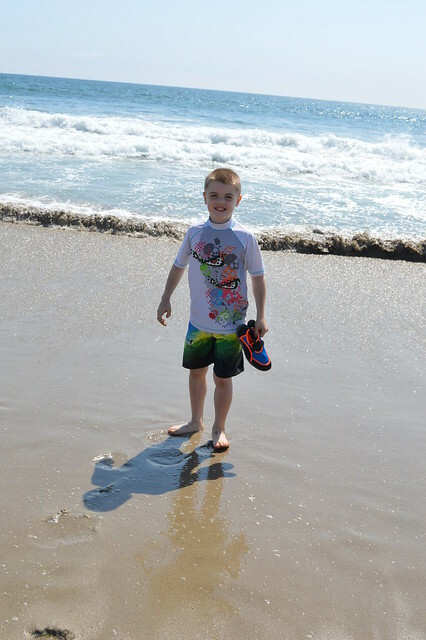 Our youngest son has never been in the Pacific so he ticked off an item on his travel bucket list when he bounded off into the waves. The number of surfers in the water testified to the power of the water. The current was pretty strong and the waves were formidable so we insisted that our children did not swim out too far from the shore. They did not mind because they had a complete blast crashing around in the waves and burying each other in the sand. 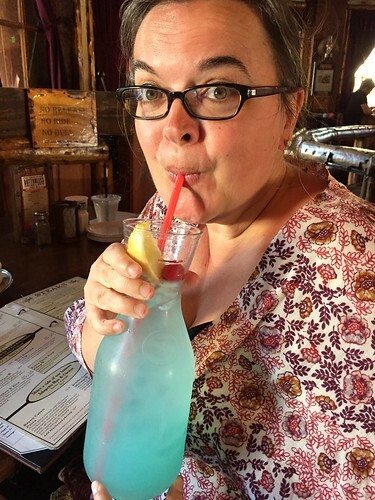 It was the perfect, most refreshing way to start our vacation.